I have been reviewing children's books since 2009, and only recently stumbled across Downtown Bookworks, a children's publishing company launched three years by a fellow mom, Julie Merberg. Inspired by her 4 sons, the "Downtown Bookworks' mission is to keep kids engaged in reading, and in the outside world; to spark their imaginations, and to encourage curiosity—with books and kits that are fun, educational, beautiful, and feel good in small hands. Julie was determined not to lose her own children, much less a generation of growing minds, to the passive consumption of entertainment on screens...determined to raise a generation of book lovers. The hands-on learning theme is common to all of these far-reaching ideas: craft kits that use household recyclables; a "nothing sharp, nothing hot" illustrated cookbook; chunky books with keys that unlock actual doors; nature guides packaged with a magnifier jar and mesh bag in a treasure box...All of these books demand a child's engagement— whether they're making something cool with their crafty little hands, interacting with textures and moving parts on the page, or collecting seashells and pinecones. And for kids who are too little to read on their own, parent-friendly books featuring fine art, fabulous shoes, super heroes, and even Shakespeare are a pleasure for parents to share with their children, laying the groundwork early on for a lifetime of reading. According to Julie of Downtown Bookworks, "the most rewarding experience in the world is to sit with your child in your lap and show him the world." And, I have to agree with her. This is why I love to read books throughout the day with my girls, show them how I love to read, and give them books for birthday and holiday gifts." Recently, I was sent a fun cookbook from Downtown Bookworks, which is geared towards kids ages 4-8 years old called "The Do It Myself Kids' Cookbook" by Laurie Goldrich Wolf to review with my daughter and niece and nephew. This was the first time I had viewed a book from this children's publishing company, but have to say if all the books are like this one, then they are all winners! Buy this book for only $15.38 from Amazon. If you follow my blog, then you know how much I love to cook, and how I read cookbooks I receive to review and buy as if they were novels, cover to cover. And, when I find time to get into the kitchen, I love trying out new recipes and revamping family favorites to put a new spin on them or to give a healthier take on them. Now that my girls are getting older, I am able to get into the kitchen more, as they love to help me cook and bake. :-) Well, Bella prefers to lick the bowl and taste test, but Savannah is learning how to mix, crack an egg, measure out dry ingredients and loves to set the timer and eagerly waits for it to go off, so that she can see what "she" had made. With all the cookbooks I own, I don't have any that are geared towards children, and provides kid-friendly recipes that they can create on their own. While my daughter is still a little young, I am always present when we are whipping up something in the kitchen. And, when my niece and nephew are here, they love to push up their sleeves and create tasty treats. And, when to the recipes, they also include photos of the tools and ingredients needed, along with illustrations that go hand-in-hand with the easy to follow, step-by-step instructions. When working with little ones in the kitchen, they can still take full advantage of this cookbook by following along with the pictures, in case they can't read all the words. Most of the recipes have 4-5 steps, so kids can whip up tasty treats and delicious sandwiches in no time at all. And, with limited tools and ingredients needed for each recipe, clean up is a breeze. Savannah is starting to help with clean up by bringing the measuring cups, utensils, etc. to the sink to be washed. And, then she holds the kitchen towel and helps dry. Just the act of helping to clean up makes her feel more involved in the kitchen. This fun cookbook for kids includes 45 recipes that don't require sharp utensils or the use of the oven or stove top. I love this, and know other parents will, who may be hesitant to let kids get in the kitchen and create tasty snacks, sandwiches, etc. Many of the sandwich recipes have you use a plastic knife or cookie cutters to cut out fun shapes in the bed. Because Savannah is too young for a plastic knife, I let her use plastic cups to make round sandwiches or fun cookie cutter shapes to make their finger sandwiches that much more fun to eat and show off. There are still a handful of recipes left to try, and we are determined to try each and every one by the end of the year. :-) Then, we will go back and make our favorites again, and also try to add our own spin on recipes by switching up ingredients with the girls' favorites, etc. Can't wait to see how these reinvented recipes come out. Who knows? Maybe we will write our own kid-friendly cookbook one day. 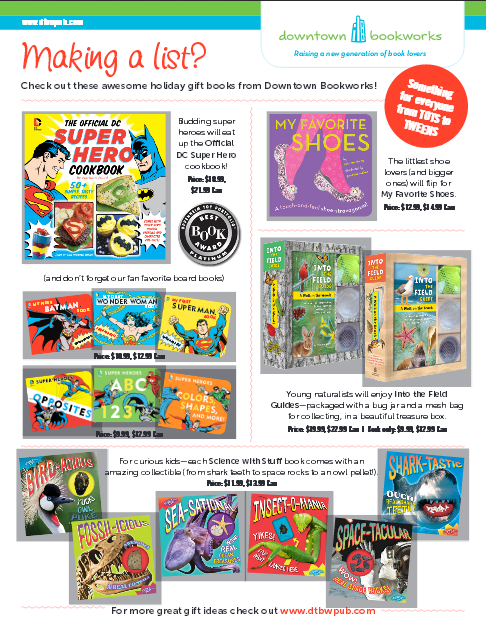 In addition to the "The Do It Myself Kids' Cookbook" by Laurie Goldrich Wolf, these other Downtown Bookworks books would make for great gift ideas and stocking stuffer for your children. Giving the gift of reading is one of the best gifts to give children of all ages, and will help they learn new things and get excited about reading as they get older. I didn't know about childrens cookbooks until I read your review thanks so much for sharing this one I know some kids that would really enjoy this one. Merry Christmas.